A freeform pool (ie not a regular shape) in Hinksey Park, a wonderful green and watery haven for people and wildlife just ten minutes walk from the city centre of Oxford. Large heated outdoor pool with an area dedicated to lap swimming and a large family fun area. Poolside café. 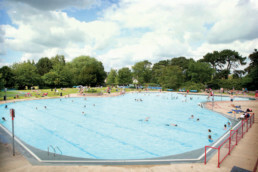 Hinksey Park began life as the landscaped grounds of the city waterworks which opened in 1856. The waterworks closed in 1934 and the pool was created then from the former filter beds. It was unfenced and swimming was free until the 1950s. 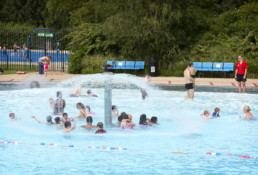 Fusion Lifestyle currently manages the pool via a management contract with Oxford City Council. It opens seasonally and hosts special events as well as swimming.